Fighter Ace Johnnie Johnson leads MkIX Spitfires of his No.144 Canadian Wing back to their base at Ford after a long day of operations over Normandy shortly after D-Day. The wing flew constant fighter sweeps throughout the Normandy Invasions, before relocating to France on June 15th 1944. 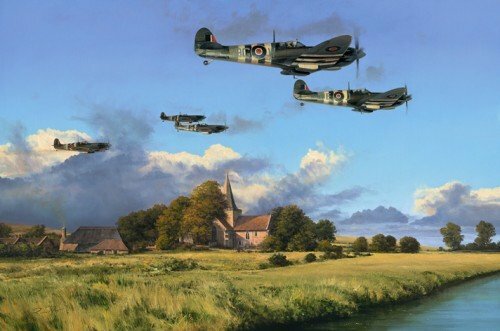 This superb new edition is personally signed by outstanding Aces who flew with the Canadian Wing during the Normandy Invasions, under the leadership of the highest scoring RAF Ace of WWII – Johnnie Johnson.